Marrakech, Morocco.... sounds exotic, doesn't it? Experience the sights, sounds and secrets of the Red City with stylist and tastemaker, Maryam Montague, who will take you on an unforgettable, once in a lifetime journey. Marrakech. Even the name sounds like something out of a fairytale. You've always wanted to go but it all seems too complicated to plan on your own. What to see? What to do? Where to shop? Where to dine? How can you get the most out of it all - safely and in style? Let us take out the hassle and plan everything for you! You'll spend a week with Maryam as your personal stylist and guide, exploring everything the city has to offer. It will be a trip you will never forget! Peacock Pavilions is a handmade, artisanal boutique hotel in an olive grove on the outskirts of Marrakech. Peacock Pavilions was designed and built by American author, blogger and designer, Maryam Montague, and her American architect husband, Chris Redecke. The boutique hotel consists of 2 guest pavilions; as well as luxury tented bungalows. There is also a pool, an Arabian dining tent, outdoor cinema, yoga tent, outdoor gym, and terraces overlooking sublime views of the Atlas Mountains. Peacock Pavilions has been featured in dozens of media, including Elle Décor, House & Garden, Food & Wine, as well as on CNN, House and Garden TV, and the Travel Channel. Additionally, Peacock Pavilions is a favorite for beautiful parties, including for designer Jimmy Choo, as well as for fashion shoots, including for J Crew. In the Fall of 2016, Forbes Magazine named Peacock Pavilions 1 of the 8 most beautiful hotels in the world. Maryam is an American designer, hotelier and humanitarian, as well as founder of the #tribalchic lifestyle brand, M.Montague. She lives in Marrakech at Peacock Pavilions with her architect husband and 2 children. In addition to acting as Peacock Pavilions' creative director, she is also the curator and designer for the M.Montague Souk,her shop of tribal-inspired and Moroccan home décor. In her spare time, she loves to write and take pictures. Her book, Marrakesh by Design was released by publishers in the US, UK and Australia, and was named a Best Book of the Year by the editors at Amazon and featured in over 100 media outlets. Maryam is Travel & Leisure's Magazine's Marrakech expert and a frequent contributor to magazines and brands. She has been featured on CNN International multiple times and was recently in the New York Times Magazine with her favorite tips on Marrakech. Forbes named her 1 of 6 "women hoteliers shaking up the travel world." 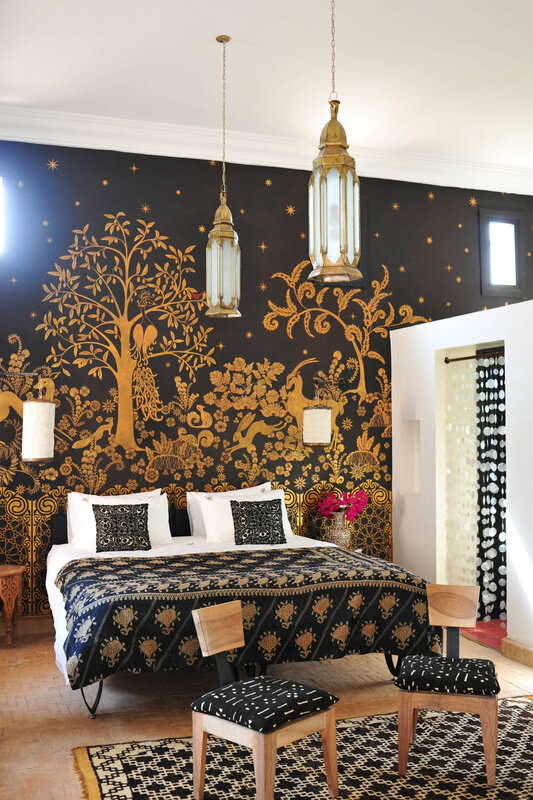 Immerse yourself in the full sensory experience of Marrakech. Let the buzzing energy of the city carry you through a thousand years of culture (literally!). The city is famed for its beautiful palaces, shrines and tombs, inspiration for designers, authors and filmmakers world wide. Marrakech is also a well known shopper's paradise but its winding labyrinth of souks remain a mystery to all but those who live there. Let Maryam be your guide to the city like only a stylist can! As author of Marrakesh by Design and frequent contributor on Marrakech to television shows and magazines, Maryam knows all the best places in the city. Let her provide you with an incomparably curated experience that includes exploring, shopping, dining and pampering. Listed as one of the best places to travel in 2017 by both Forbes and The New York Times, Marrakech is truly unforgettable. Don't you want to be a part of it? A very special final surprise at the end! This is a Give-Back retreat, which will be donating $1500 of proceeds to the girl's empowerment charity, Maryam founded, Project Soar. Nonrefundable reservation deposit due upon booking: $750 per person. Please email ppavilions@gmail.com to reserve your space on these exclusive retreats. We will operate on a first come, first serve basis upon confirmation of payment. You will not be charged if the retreat is overbooked. All payments, once made, are nonrefundable. Note: This is a wonderful retreat to come on with a friend, a spouse, or group of friends. If you would like to request this retreat for your own private group, please send us an email at info@peacockpavilions.com.